We make Pocket Badges in St.Steel, Brass, Aluminium, Backelite which is required by all security agancies, Police, Hospitals, Railways, Hotels etc. required to be displayed on thier pockets. 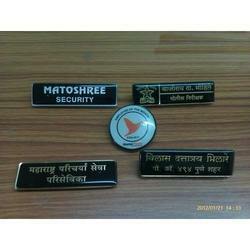 Our Pocket Badges are manufactured by the quality raw material also with polycoat as per requiremewnt. These are available at reasonable competitive price. We follow a strict vendor selection policy to develop association with renowned manufacturers of the industry. Pricing depends on Size ( Normal Size is 75 mm x 25 mm i.e. 3" x 1" ) and material Thickness. 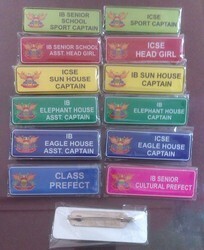 There are three options of attachments of Badges i.e Pin, Crocodile Clip and Magnet. Kindly select the same, which will enable us to quote for your requirement. Size (feet X feet) 3" x 1"
We offer an exclusive range of Pocket Badges (Plan & Polycoats) that are used in various organizations Like Hotels, Hospitals, Malls, Shops, Railways, Police & other Security Personnel, Made of the finest raw material in S.S./Brass/Aluminium, these pocket badges are provided in wide options of colors, size and shape to choose from as per the customers requirements. We manufacture Pocket Plates in Aluminium, St.Steel, Brass, Silver which are required by Hotel, Mega Marts, Shops, Banks, Security force, etc. with or without Epoxy coating & Metal clip or Crocodile or Tie Clip or Magnets can be put behind the plates. Prices depends on Material, Coating Req. , Quantity & clip Type etc. 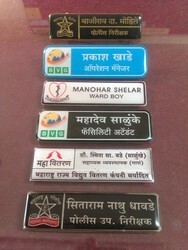 We make Metal Printed Election Badges on Aluminium with Epoxy Coating in Bulk Quantity. Min. Order Qty.5000 Nos. We require Edited Image as shown in sample. Packaging Details: Individually packed in Jewellary seal pack. 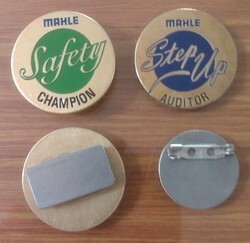 We make promotional badges or brooches for companies in brass in 24 swg with or without epoxy coating, st. Steel in 24 swg. , aluminum 24 swg with epoxy coating having three different types of attachments i. E. Pin, crocodile clip or magnet. Prices depends on size and quantity. We manufacture Pocket Plates in Aluminium, St.Steel, Brass, Silver which are required by Hotel, Mega Marts, Shops, Banks, Security force, Schools etc. with or without Epoxy coating & Metal clip or Crocodile or Tie Clip or Magnets can be put behind the plates. Prices depends on Material, Coating Req. , Quantity & clip Type etc.